The groundwater vulnerability (Scotland) dataset, Version 1, was produced in 2004 by the British Geological Survey (BGS) and the Macaulay Institute (now the James Hutton Institute) on behalf of the Scottish Environment Protection Agency (SEPA), funded by the Scotland and Northern Ireland Forum for Environmental Research (SNIFFER). The dataset comprised a GIS- based groundwater vulnerability screening tool and an associated report describing the groundwater vulnerability screening methodology (Ball et al. 2004, Ó Dochartaigh et al. 2005). This revised version (Version 2) uses updated input data and a slightly modified methodology to develop new GIS-based maps. Related BGS datasets that the user may also be interested in are maps of bedrock and superficial deposits aquifer productivity for Scotland (Ó Dochartaigh et al. 2015, MacDonald et al. 2004); permeability index datasets (British Geological Survey 2010); superficial deposits thickness datasets (Lawley and Garcia-Bajo 2009); and DiGMapGB-50 (the Digital Geological Map of Great Britain at 1:50 000). A related external dataset is the Hydrology of Soil Types (HOST), available through the James Hutton Institute (Boorman et al 1995; http://www.macaulay.ac.uk/host/). The groundwater vulnerability dataset is a screening tool that shows the relative threat to groundwater quality across Scotland from contamination. Groundwater vulnerability is a term that has been in use for more than 30 years and has been interpreted in different ways. The accepted definition of groundwater vulnerability in the UK and other European countries is ‘the tendency and likelihood for general contaminants to reach the water table within the uppermost aquifer after introduction at the ground surface’ (Ó Dochartaigh et al 2005). Groundwater vulnerability therefore accounts for intrinsic properties of the vertical pathway in the unsaturated zone (above the water table), whether within an aquifer or its overburden. All groundwater is to some extent vulnerable to contamination from surface or sub- surface sources (Foster 1998), and one of the objectives of vulnerability maps is to integrate geological and hydraulic charactersistics of aquifers and overlying material to indicate the relative risk to groundwater from contamination. The groundwater vulnerability dataset does not account for the movement of contaminants through the saturated zone of an aquifer after reaching the water table. Separate aquifer productivity maps have been developed to help characterise this pathway (Ó Dochartaigh et al. 2015). 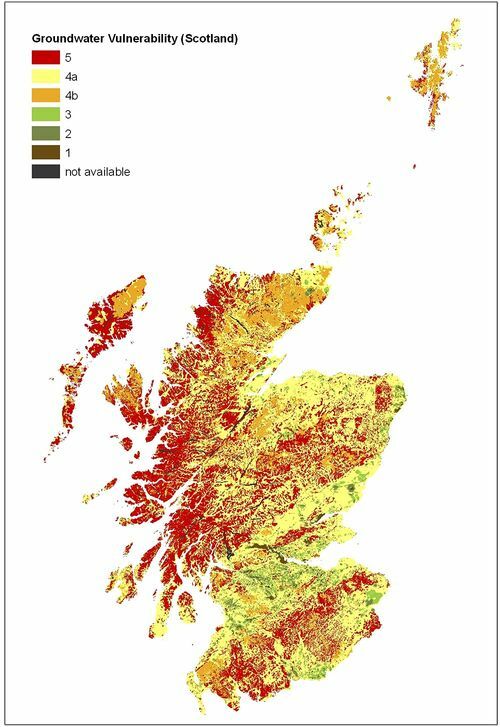 The groundwater vulnerability map (Scotland) is shown in Figure 1. Groundwater vulnerability is described by one of five relative classes ranging from 1 (lowest vulnerability) to 5 (highest vulnerability) (Table 1). How can the dataset be used? The groundwater vulnerability dataset is a screening tool that provides specific information on the vertical pathway to the water table. It is not a complete solution to groundwater risk assessment and site suitability studies. It can provide guidance on the vulnerability of groundwater at a regional scale, highlighting areas at comparatively higher risk of groundwater contamination, and can help indicate the level of specific site investigation required for a new development or activity. Groundwater vulnerability maps provide information on the pathway followed by pollutants resulting from human activities – e.g. related to industrial, urban, agricultural or domestic practices – to the water table. They are used, along with an assessment of the hazard and of the consequences of pollution occurring, to help calculate the degree of risk of contamination caused by such activities. The dataset allows for regional assessment of groundwater vulnerability as one stage in the process of assessing overall risk to groundwater, for example when combined with land use and aquifer maps. The groundwater vulnerability (Scotland) Version 2 dataset has been developed at 1:100 000 scale and must not be used at larger scales. It is not designed to assess groundwater vulnerability at a single point. All spatial searches against the data should therefore be conducted using a minimum 100 m buffer. The groundwater vulnerability (Scotland) Version 2 dataset is based on, and limited to, an interpretation of the records in the possession of the British Geological Survey at the time the dataset was created. There is a risk that the obvious may be obscured and the subtle indistinguishable. Who might benefit from using the dataset? The groundwater vulnerability dataset was originally developed for use by the Scottish Environment Protection Agency (SEPA) for protecting and managing groundwater and informing their response to land use planning applications. Other potential users of the dataset are regional planners and managers in Local Authorities and national government. Identifying areas where groundwater is vulnerable to contamination is a key stage in effective environmental management, for example related to sustainable agricultural and industrial practices and land use planning applications. Any individuals or bodies involved in the activities listed in Section 2.3 are likely to find the groundwater vulnerability dataset useful. Figure 1 The groundwater vulnerability (Scotland) map, Version 2. Table 1 Groundwater vulnerability classifications and their interpretation. ↑ 2.0 2.1 Ó Dochartaigh B É, Ball D F, MacDonald A M, Lilly A, Fitzsimons V, del Rio M and Auton C A. 2005. Mapping groundwater vulnerability in Scotland: a new approach for the Water Framework Directive. Scottish Journal of Geology 41 (1), 21-30. ↑ 3.0 3.1 Ó Dochartaigh B É, Doce D D, Rutter H K and MacDonald A M. 2015. User Guide: British Geological Survey Aquifer Productivity (Scotland) GIS datasets, Version 2. Revised Report. BGS Open Report OR/15/003. ↑ MacDonald A M, Ball D F and Ó Dochartaigh B É, 2004. A GIS of aquifer productivity in Scotland: explanatory notes. BGS Commissioned Report CR/04/047N. ↑ Foster S S D. 1998. Groundwater recharge and pollution vulnerabiloity of British aquifers: a critical review. In Robins N S (ed.) Groundwater Pollution, Aquifer Recharge and Vulnerability. Special Publications, 130, Geological Society, London, 7-22. ↑ US National Research Council. 1993. Groundwater vulnerability assessment: predicting relative contamination under conditions of uncertainty. National Research Council (US) Committee on Techniques for Assessing Groundwater Vulnerability, National Academy Press. This page was last modified on 23 July 2015, at 15:59.